As you can find in Babylon101 there are many properties of the particle system that can be tweaked to control the look of a particle system. Babylon.js allows you even more customization to obtain the system you want. These can be split into into two types custom functions and custom effects. updateFunction: provides an update to each particle each frame and can effect position, color, age, size etc. Try to keep it simple and fast. You can directly attach all these functions to the particleSystem. Since Babylon.js V3.2 you can use the first two, startDirectionFunction and startPositionFunction, in creating a new particle emitter type as was done with the createBoxEmitter, createSphereEmitter and createConeEmitter. A little trickier since the particles are to start from size 0 both min and max sizes must be 0 and a new property must be added to give the final size. Starting from Babylon.js V3.2 you can create a new object of type IParticleEmitterType into the particle system. 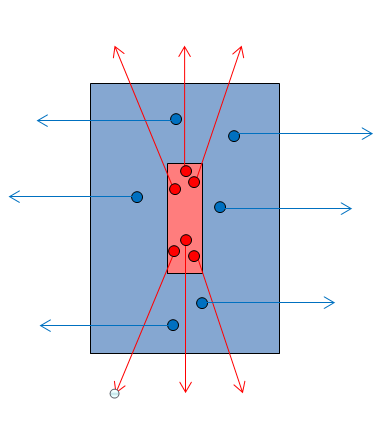 Examples of this type of object are sphereParticleEmitter and coneParticleEmitter which are produced by using createSphereEmitter and createConeEmitter. These objects are assigned to a new property particleEmitterType of the particleSystem. You use the startDirectionFunction and startPositionFunction as methods for objects of this type to determine the region of space that the particles are emitted from and their direction of travel. You can create your own ParticleEmitterType by extending IParticleEmitterType and assigning it to particleEmitterType, overriding the default methods startDirectionFunction and startPositionFunction. Below is an example to create a new spray emitter which will send streams of particles out of the top, bottom and sides of a cylindrical region. In order to determine where a particle is emitted from the cylinder is divided into two regions as in the diagram below. Any particle with a start position inside the red region is emitted in the direction from the center to the particle. Any particle with a start position inside the blue region is emitted horizontally. The createSprayEmitter method sets the radius and height of the cylinder, creates a new SprayParticleEmitter object which is assigned to the 'particleEmitterType` property. The SprayParticleEmitter class is formed with two methods startDirectionFunction and startPositionFunction and Babylon.js takes care of the rest. The customEffect is a type of BABYLON.Effect used to target a valid shader program and is created with the createEffectForParticles method of the engine object. samplers: [strings], array of names of samplers for additional textures! By default Babylon.js will give you a vUV and a vColor varying parameter. It will also transmit you the particle texture. then pass it using setFloat with an onBind method for customEffect. The particle effect object is a slightly-modified Babylon Effect Object. Also notice that the ShadersStore is a namespace upon this special effect-object.